How much does it cost to travel to Kotor? How much money will you need in Kotor? €77 ($87) is the average daily price for traveling in Kotor. The average price of food for one day is €34 ($38). The average price of a hotel for a couple is €73 ($82). Additional pricing is in the table below. These average travel prices have been collected from other travelers to help you plan your own travel budget. A coastal town of Montenegro, Kotor is also a beautifully-preserved fortified, medieval town, featuring a labyrinth of cobbled streets, lively piazzas, historic churches, and a spread of bars and restaurants throughout its historic Old Town. Kotor lies nestled on the shores of the Bay of Kotor. Though it resembles a fjord, the Bay is actually a submerged river canyon, surrounded by the beautiful mountain scenery of Mt Lov?en. Together the town of Kotor, the Bay of Kotor, and the surrounding territory make up a protected UNESCO World Heritage Site. The central part of Kotor sits on a triangle of land that juts out into the Bay. It is fortified by medieval town walls and spotted with landmarks like St Tryphon’s Cathedral, which was first built in the 11th century in the Romanesque-Gothic style. Another landmark is St Nicolas Church, the biggest Orthodox Church in the Old Town. Others include the Tower watch (8th century), the Cathedral of Sveti Tripun (13th century), the Church of Sveti Luka (13th century), the Prince&apos;s palace (17th century), the Church of Sveta Marija (12th century), the Church of Our Lady of Health (Gospe od Zdravlja) (15th century), and Napoleon&apos;s Theater (19th century). As far as local cultural history goes, the Maritime Museum offers just about anything to do with Kotor seafaring. It is housed in the baroque palace Grgurin, and features the successes of famous Kotor seaman, artists, ship builders, crafts man, states man, and diplomats. Visitors will also find portraits of famous captains, models of old galleys and sail boats, navigational instruments, photographs, uniforms, weapons, paintings, and model ships. Also keep an eye out for islands on the Bay. The Island Gospa od Skrpjela or "Our Lady of the Rock" and the Island Sveti Djordje (St George) or "The island of the dead captains" are both associated with local legends. 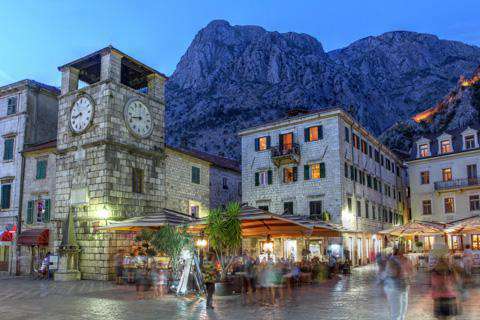 The town of Kotor developed around its "Stari Grad" or Old Town, where most of Kotor&apos;s history, culture, and tradition have been preserved. Fortified by a medieval wall and lined with a maze of cobbled streets, walking amidst Kotor&apos;s Old Town is like walking back in time. The narrow streets open up into several charming squares and markets, and there are examples of medieval architecture at every turn including churches, cathedrals, palaces, and museums. Some of the most impressive churches include the 12th century St. Tryphon Cathedral, the Church of St. Luke, and the Orthodox St. Nicholas Church. These are often used as landmarks for visitors and locals alike to avoid getting lost in the medieval tangle of alleyways. The streets open up into the Trg od oruzja (or Square of Arms), which is the largest square and a popular place for gathering since it was created centuries ago. Kotor is small enough to navigate on foot, but there are plenty of winding twists and turns to discover. Visitors can also climb up the Upper Town Walls more than 1,300 steps for spectacular views of the town and the Bay. There are also adventures to be had on the outskirts of Kotor, like paragliding off the surrounding cliffs or river rafting on Tara River a few hours inland. Hiking is another common activity in the hills surrounding Kotor. Just outside the north gate of Old Town, visitors can follow a path for a scenic hike over the town and bay, eventually leading through dense woods to a waterfall. And finally, there are many old Austro-Hungarian fortresses abandoned in the hills near Kotor, such as Fort Vrmac just across the bay. Many of these ruins can be hiked to as well. Because of its proximity to the sea, Montenegro has plenty of fresh fish and seafood dishes. These dishes are typically garnished with polenta, blitva (a kind of spinach), or broiled potatoes. Drying fish is also traditionally practiced along the coast. Another specialty of Montenegrin cuisine is a variety of soups: &apos;supa&apos; for clear soup, &apos;?orba&apos; for a thick soup or stew, and &apos;kaa&apos; for a porridge-style dish. For dessert, there is an assortment of local sweets, including pala?inke (a large pancake filled with jam, chocolate or cream), baklava with raisins and walnuts, krofne (doughnut filled with jam or chocolate), and a cream layered cake called krempita. Most sweets are served with coffee. Kotor has a wide variety of places to eat from seafood and national cuisine like the dishes mentioned above to western food like pizza or barbeque. Old town will have the most options for dining. The nearest international airport is Tivat Airport, about 8 kilometers (5 miles) from the center of Kotor. It offers many flights within Europe, especially during the summer season. Podgorica Airport is another popular option for flying and serves as a hub for Montenegro Airlines. While these two are Montenegro&apos;s main international airports, it is sometimes easier for visitors to arrive via Dubrovnik Airport (in neighboring Croatia), since it operates a greater range of flights and airlines. During tourist season it is also popular for visitors to arrive in port via cruise ship. Kotor is almost like a smaller Dubrovnik. It has far less crowds, and isn't exactly as "sculpted" as Dubrovnik, but with that you get authenticity. It's a wonderful, historic, walled city that's beautifully positioned on the coast near mountains and shockingly blue water. If you're looking for a place to stay, your best option is to rent a room out of someone's house. You really do get a feel for what it's like to live in the old town, and it's much cheaper than many of the other options around town. You do have to be flexible though. Head over to the visitor center and they can likely set you up with someone who rents rooms.